From service rooms to wellness oasis featuring all sorts of necessary comforts to have an authentic moment of relax: our home’s bathrooms are continuously evolving into wide and comfortable living spaces, composed with iconic and minimalistic elements. Sculptural lines, design furnishing and new-generation accessories fill these spaces with the latest tendencies, which are all pointing in the same direction: Luxury. Marble bathrooms are the latest trend, like jewels embedded in “magic boxes”, as mentioned by designer Pietro Russo, who just restored an apartment in the Île de la Cité in Paris, covering the master bathroom with a unique slab of Grey marble with brass coating (the latest luxury frontier after silver and gold); then we have architect Luciano Giorgi, whose latest creation in South Kensington shows a bathroom with walls made of polychromatic marble decorated with modern geometric designs. 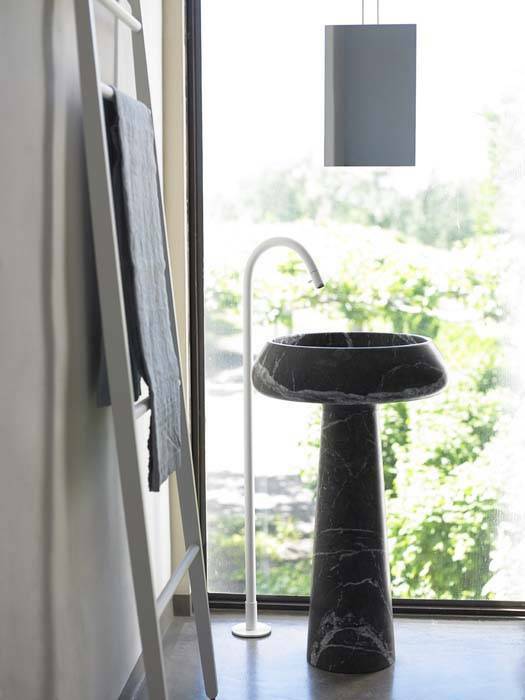 Marble, an elegant and luxurious material by excellence, becomes the protagonist of our bathrooms not only for the walls but also for the furnishing objects of the ambiance: such is the case of the Bjohn sink, designed by Angelo Mangiarotti for Agape, based on an idea of the 1970’s, modernized and readapted to the concept of modern luxury. The conical truncated column can hold different shapes of basins, giving life to an object of strong sculptural presence, that gives a touch of timeless classiness to any ambiance. Another marble-made model with a completely different impact is Lavabo 815, designed by the Benedini Associati studio, also for Agape. 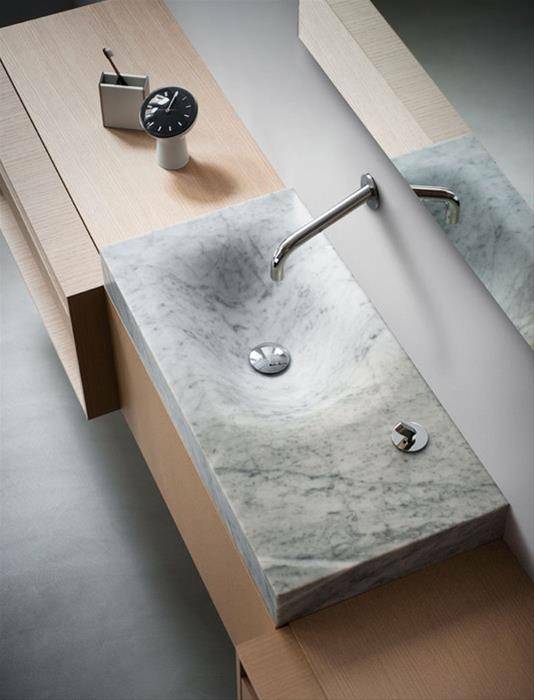 This sink is presented as a thick rectangular block of an assimetric shape that reminds us of the naturalness of the erosion produced by rain on a rock. Available in Carrara marble and other stones at the customer’s choice, this furniture piece can be placed both on a wall or resting over the Flat XL programme container. 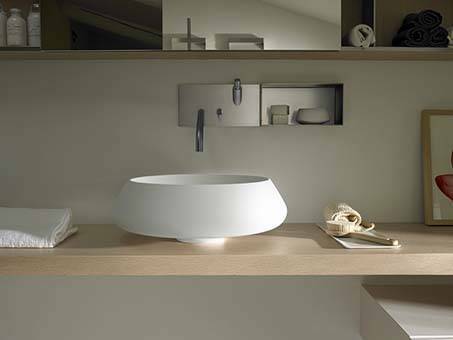 As for the shower, the main element of every bathroom, Antonio Lupi re-proposes it as a real island. Isola is in fact the name of his latest shower model: a 360º shower, placed in the middle of an elegant bathroom space and separated from the rest of the ambiance by a fine 8mm layer of glass. In this way, the water turns into the protagonist of the bathroom area projected by Antonio Lupi, creating a clean atmosphere in which the voice of nature can be heard even in the most urban apartments. Always on the quest to become a wellness ambiance, the bathroom has recently been interpreted as a place of ritual, taking canons and stereotypes and examining them to the tiniest detail in order for the space to communicate that sense of wellbeing and tranquility of exotic places like saunas and hammams. 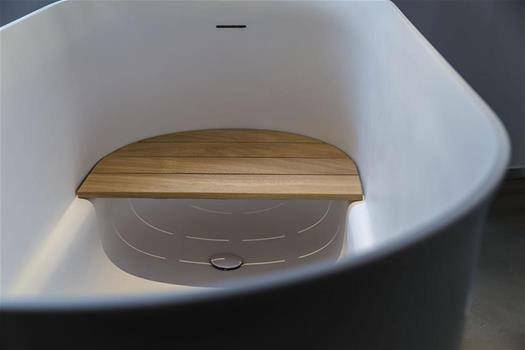 Immersion, a bathtub designed by Lyndon Neri and Rossana Hu for Agape, has the purpose of involving us in a unique sensorial experience. The oriental bath ritual has been re-interpreted in this object, changing the traditional wooden tub for a bathtub that reproduces the typical thermal sensations of the oriental culture: The tub actually allows different positions, a more raised one, thanks to a wooden seat placed on one side; and another one completely immersed, contributing to the relaxing sensation, wrapped in the steam that slowly rises from the water surface. 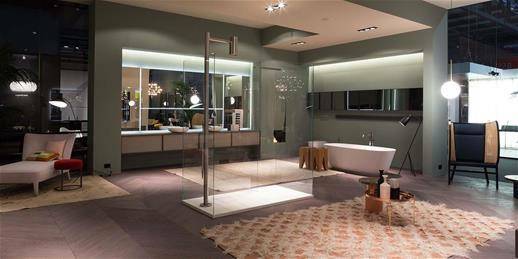 This is definitely a project that allows the user to experience the bathroom area with a fresh pair of eyes. Because of it’s dimensions, this bathtub adapts itself perfectly even in restricted spaces; it is in fact smaller than a normal bath, making up for the space in height. 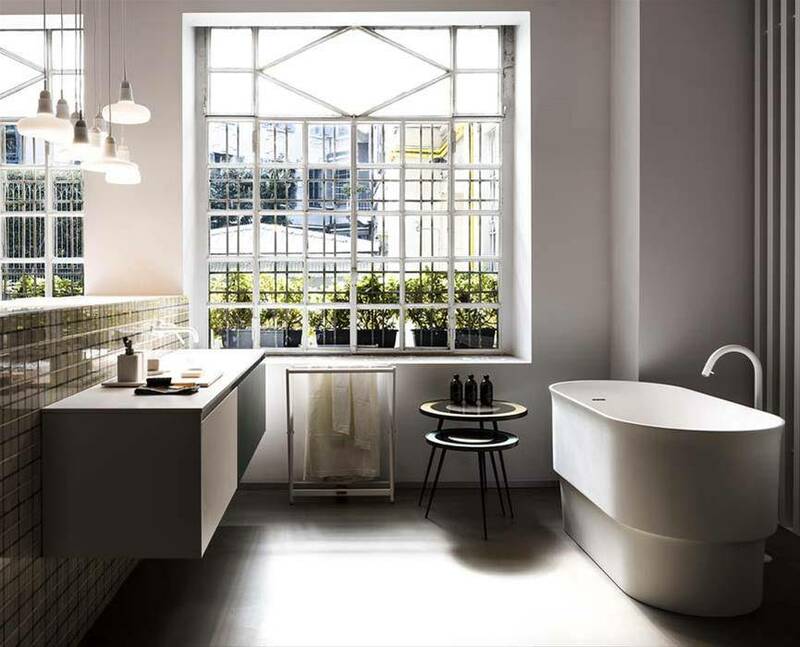 Staying within the lines of minimalism we find the Simple collection, designed by Piero Lissoni for Boffi. This line is composed by a container modular system without handles, completed by either drawers or a single door. Both solutions (available in a wide range of materials to be selected by the customer) are opened by a “Tip-On” system, which gives the furnishing a truly elegant and essential touch. 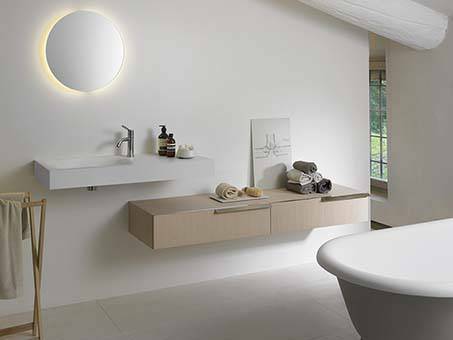 Finally speaking of luxury bathrooms, we can’t forget to mention the brand Falper, a must in the industry, which among it’s latest novelties presents Extreme Flat. 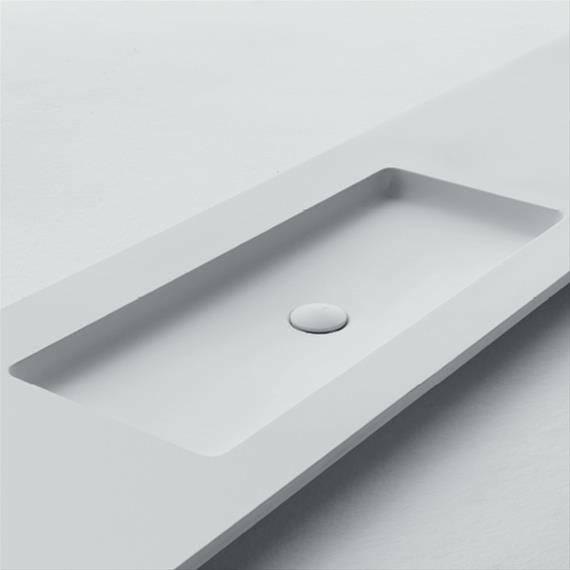 Designed by Michael Schmidt, this product has infinite possibilities of personalization in it’s dimensions and thickness, as well as in the positioning of the sink, all of it elaborated in Cristalplant Biobased, which is certified as the best performing material in the world for the construction of sinks and bathtubs and has tactile and reflecting effect which is soft and uniform. Always aiming to create an ambiance of sober luxury oriented towards minimalistic lines, this object achieves to convey elegance and character in any way it is personalized.